NMNAT inhibitors still wait to be identified. Thus, it is unknown how intracellular NAD metabolism and cellular homeostasis are affected in conditions of complete inhibition of the nicotin- amide salvage pathway. Such information would be relevant for a deeper understanding of the NAD metabolome, for the design of more potent tumor cell killing strategies based on metabolic approaches, and for the identification of rescue therapies designed to spare healthy tissues from the effects of NAD-depleting agents. In this study, we screened a new series of compounds bearing a new pharmacophore of NAMPT inhibitors, and identified a lead, previously known as Vacor (pyrinuron; Lewitt, 1980), as a compound able to be originally converted by the consecutive action of NAMPT and NMNAT into the NAD antimetabolite Vacor adenine dinucleotide (VAD). 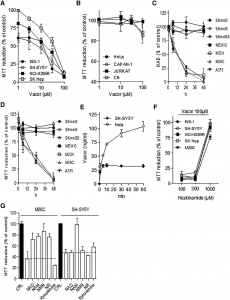 We show that Vacor prompts extremely rapid derangement of NAD homeostasis, energetic metabolism, and cytotoxic activity only in NMNAT2-proficient tumor cell lines and xenografts. (A–D) Dose effect of Vacor on sensitive (A) and insensitive (B) cell lines at 24-hr incubation. Effect of 100 mM Vacor on different melanoma cell lines over time on NAD content (C) and viability (D). (E) Time-dependent intracellular Vacor accumu- lation (used at 100 mM) in SH-SY5Y and HeLa cells. (F) Effects of nicotinamide on Vacor (100 mM/24 hr) cytotoxicity. (G) Effect of different NAD precursors (1 mM) on Vacor cytotoxicity (100 mM/12 hr). Each point/bar represents the mean ± SEM of at least 3 exper- iments. pounds. Remarkably, notwithstanding the structural similarity of the chemicals, only compound 6 (3-(4-nitrophenyl)-1-(pyridin-3- ylmethyl)urea) depleted NAD pools and caused cell death (Fig- ures S1B and S1C). Unexpectedly, we found that compound 6 is the old rodenticide Vacor (also known as Purynor). Curiously enough, Vacor intoxication in humans can be efficiently treated by intravenous injection of the metabolic NAD precursor nicotin- amide (Lewitt, 1980). Surprisingly, a careful analysis of the literature revealed that the pharmacodynamic mechanisms underlying this antidotal effect have never been investigated. Being intrigued by this finding, we then screened Vacor against different cell types, and found that in addition to neuroblastoma, Vacor caused rapid death of INS-1 (insulinoma), NCI-H295R (adrenal corticocarcinoma) and SK-HEP (hepatocarcinoma) cells, whereas Capan-1 (pancreas adenocarcinoma), C6 (gli- oma), HeLa (cervix adenocarcinoma), and Jurkat (T cell leuke- mia) cells were completely insensitive to Vacor (Figures 1A and 1B). We also tested Vacor on different human melanoma cell lines because of the overexpression of NAMPT in this neoplasm (Maldi et al., 2013). We found that only three of them underwent NAD loss and cell death when exposed to the compound (Fig- ures 1C and 1D). We next compared how intracellular Vacor contents rise over time in sensitive and insensitive cells, and un- expectedly found that they increased more in HeLa (insensitive) than in SH-SY5Y (sensitive) cells (Figure 1E), thus ruling out that selective toxicity was due to pharmacokinetic issues. Notably, in keeping with clinical evidence, nicotinamide dose-dependently prevented Vacor cytotoxicity (Figure 1F). However, other meta- bolic NAD intermediates (with the exception of kynurenine) and NAD itself protected melanoma but not neuroblastoma cells (Figure 1G). The latter, however, were protected when nicotinamide mononucleotide (NMN) was used at 10 mM (not shown). It is well known that poly(ADP-ribose) polymerase (PARP)-1 hyperactivation completely exhaust the intracellular NAD pool (Chiarugi, 2002). Hence, to understand whether PARP-1 activa- tion concurs with NAD loss by Vacor, we tested the effects of three different PARP-1 inhibitors, and found that they did not affect dinucleotide depletion (Figure S1D). 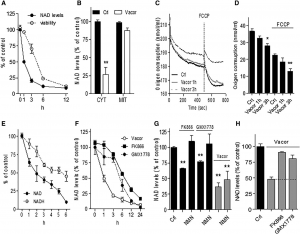 (A) Comparison of the temporal kinetics of NAD depletion and cell death (propidium iodide staining) induced by Vacor (100 mM) in SH-SY5Y cells. (B) Cytosolic and mitochondrial NAD content in SH-SY5Y exposed to Vacor (100 mM/1 hr). (C and D) Representative (C) or quantitative (D) analysis of oxygen consumption by neuroblastoma cells exposed for 1 hr or 3 hr to Vacor (100 mM). The pro- tonophore FCCP (carbonyl cyanide p-trifluoromethoxyphenylhydrazone) was used at 1 mM. (E and F) Temporal kinetics of NADH depletion in comparison with that of NAD in neuroblastoma cells exposed to Vacor (100 mM). Comparison of the temporal kinetics of NAD depletion (F) in neuroblastoma SH-SY5Y cells exposed to Vacor, FK866, or GMX1778 (all at 100 mM). (G) Rescue effect of NMN (1 mM) added to the growth medium of neuroblastoma SH-SY5Y cells exposed to Vacor, FK866, or GMX1778 (all at 100 mM/6 hr). (H) Effects of FK866 or GMX1778 (all at 100 mM) on NAD contents of SH-SY5Y cells exposed to Vacor (100 mM/1 hr). Each point/bar represents the mean ± SEM of at least 3 experiments. *p < 0.05, **p < 0.01 versus control (Crl) by ANOVA and Tukey’s post hoc test.